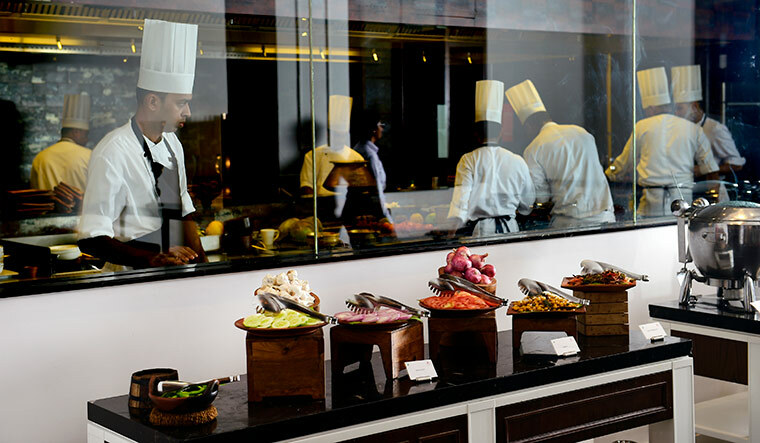 The cuisine at Cassava is an attempt to contemporise traditional Kerala food without losing its authenticity. So, some innovations are made on age-old recipes that Chef Saji Alex, the chef at Cassava, inherited from his grandmother. Like kappa pappadam pidi—crushed boiled tapioca with roasted coconut, shallots and fried pappadam. And, beetroot vazhappu cutlet—semolina crumbled beetroot and banana flower with ground spices. Cassava’s food is divided into the three regions of Kerala. So, you have the moplah cuisine of the Malabar region, with its combination of heavy spices and meat, the princely food of Travancore, and delicacies from Kochi and central Kerala. If you go to Cassava, make sure to try some of the quintessential Kerala dishes, like the Kuttanadan tharavu roast or the irachi pidi. The décor, too, is a mix of the contemporary and the traditional, with beautiful hanging trellised lamps and plush wooden furniture lending an earthy tone to the restaurant. There is a model of a houseboat, jars of spices and portraits of scenes from everyday life in the state to give a feel of Kerala to the place. Then there are the subtle touches, like the menu, which is designed like the border of a Kerala kasavu sari, and the manchattis, or mud pots, in which the dishes are served. There is a table on wheels on which are kept an assortment of chutneys and kappa for lunch, and different types of cold fish for dinner. In these days of molecular gastronomy and fusion cuisine, it was surprising to find nadan choru (rice), beef olarthiyathu, and cabbage thoran, served in a five-star setting. It tasted like home.